Whether lecturing on architectural history in a class that also covers art, or within a survey on architectural history, it is important to remind your students that there are very different demands, limitations, and criteria when it comes to architectural innovation and history. Compared to the relative autonomy of painting or sculpture, architecture always has a functional purpose and is subject to the desires and needs of its patrons and its inhabitants, as well as the physical laws of engineering and physics. In addition, because designing and constructing a building takes much more time and financial investment, movements in architectural history tend to rotate and evolve more slowly than avant-garde art movements occurring at the same time. Dialog and affinities still exist between the two, however, especially in the development of the modernist and postmodern movements. Over the course of the nineteenth century, following the birth of the Industrial Revolution, architecture changed significantly, becoming increasingly less concerned with the past and more experimental, given innovations in building materials and technology. Architects in the twentieth century continued this exploration, and created buildings much higher and more complex than architects of previous eras could dream. In the latter part of the nineteenth century and the first half of the twentieth in western countries, it was common for architecture to revive historical styles such as the Classical and the Gothic. Breaking with the past, a strain of architects of the twentieth century discontinued this tradition in order to create a more appropriate style for the modern age. Walter Gropius, Workshop Wing, Bauhaus, 1925–6. For readings that encompass the context of architectural design in the early twentieth century, see De Wit, Wim, ed. Louis Sullivan: The Function of Ornament. New York: W.W. Norton, 1986, Adolf Loos, “Ornament and Crime,” 1908, and Francisco Mujica, History of the Skyscraper, 1929/1977. Arnason, H.H. and Elizabeth C. Mansfield, History of Modern Art (New York: Pearson, 2012). William J.R. Curtis, Modern Architecture since 1900 (London, Phaidon Press, 1996). Marcel Franciscono, Walter Gropius and the Creation of the Bauhaus in Weimar: the Ideals and Artistic Theories of its Founding Years (Urbana: Illinois University Press, 1971). R. Hitchcock, The International Style (Norton, 1966; originally published in 1932). Hitchcock, et al., Modern Architecture: International Exhibition (New York: Museum of Modern Art, 1932). Elizabeth Mock, Built in USA: 1932–1944 (New York: MoMA, 1945). Hitchcock, In the Nature of Materials, 1887–1941: the Buildings of Frank Lloyd Wright (New York: Duell, Sloan, and Pierce, 1942). Neil Levine, The Architecture of Frank Lloyd Wright (Princeton: Princeton UP, 1996). Francesco Dal Co and Kurt Foster, Frank O. Gehry. The Complete Works (New York: Monacelli, 1998). Robert Venturi, Denise Scott Brown, and Steven Izenour, Learning from Las Vegas (Cambridge: MIT Press, 1972), and Complexity and Contradiction in Architecture (1966). Heinrich Klotz, The History of Postmodern Architecture (Cambridge: MIT Press, 1988). Frank Lloyd Wright, Solomon R. Guggenheim Museum, 1959, and audio interviews/descriptions on the Guggenheim’s website. This lecture is divided into three movements with two to three works of architecture each: the development of the International Style, the work of Frank Lloyd Wright, and Postmodern Architecture. Industrially produced iron and steel first began to see widespread use in architecture in the nineteenth century, decreasing overall costs and offering new opportunities to create large-scale and creative building projects. A good place to start, as a transition to the twentieth century, is Louis Sullivan’s Guaranty Trust Building (1894–5) in Buffalo, New York. Given the expansion of American cities and the premium this created on land, the logical conclusion was to start building upwards—made possible by improvements in iron and steel and the invention of the modern passenger elevator in 1852. An American architect, Sullivan was one of the first to experiment with skyscrapers in the US—this being a significant example. At the end of the nineteenth century, a skyscraper was considered to be a building with an internal metal structure that supported the exterior masonry. Some of the first attempts were only ten floors high, different than the soaring skyscraper conception we have now. Here, Sullivan was not obviously referring to or reviving an historical style. Instead, he was trying to find a new, unique modern style to foreground these new, industrial materials and the functions and technologies of the building itself. His famous credo “form follows function” exemplified his belief that a building’s interior function should determine its exterior without extraneous design components. Despite this mantra, his building still displays decoration and includes some references to past architectural styles—most noticeably in the building’s cornice—but nonetheless marks a transition from away from a total historical design. While not immediately apparent, the Guaranty Trust Building has a lot of natural and geometric detailing, influenced in part by Art Nouveau. The pattern unifies the façade while emphasizing the terracotta sheathing over the metal skeleton of the building. Sullivan understood that a building with several floors has a lot of horizontal layers, so he used the decoration to emphasize his building’s verticality. With the massive cornice on its top tier, this building’s exterior organization is often compared to the tripartite design of a classical column—with a base, piers, and an attic—thus still referencing an historical precedent (if only slightly). 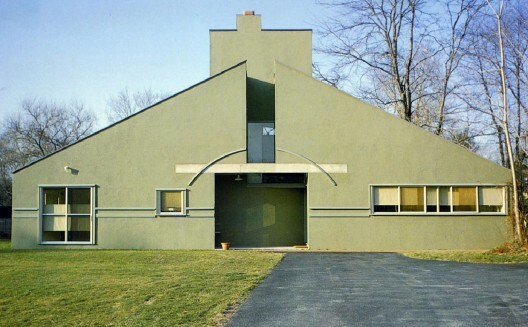 Although Sullivan still included decoration, his pared-down building style greatly influenced many architects in the twentieth century, where the material form and structural function of architecture would take precedence. As early as the 1890s, the Austrian architect Adolf Loos began calling for less decoration in architecture, a stance codified in his widely influential essay “Ornament and Crime” of 1908. Loos felt that an aesthetic of the Machine Age, rather than an organic or historical style, was more appropriate for modern architecture. Walter Gropius’s Workshop Wing, Bauhaus, created in Dessau in 1925–6 represents an important precursor of the International Style in Germany. Here, Sullivan’s “form follows function” is taken to its logical extreme, with no noticeable decoration or superfluous additions. Gropius adopted new industrial materials and, with the added support of steel, introduced the glass curtain wall, suspended freely from the steel structure without providing support. The Bauhaus, as an educational institution, introduced a revolutionary approach to the art academy and is famous for training many famous and prolific artists. In art schools, artists would typically study within one realm of specialization, but at the Bauhaus students were taught across disciplines from design, painting, printmaking, and photography. This innovative approach was one of the first times the hierarchy between craft, design, and art began to be broken—a famous and lasting legacy of the Bauhaus school. This philosophy underpinned Gropius’s open-plan construction of the Workshop Wing as well, where students and professors of all disciplines could collaborate without physical barriers. The wing consisted of classrooms, studios, workshops, a library, and also living quarters for faculty and students. In addition to designing the Dessau campus, Walter Gropius served as the director of the school from 1919 to 1928. The school originally opened in 1919 in Weimar, Germany, but due to a new, more conservative government formed in the unstable environment after World War I (eventually giving rise to the National Socialist (Nazi) party), the school and its socialist agenda were suppressed. The less conservative Dessau, a growing industrial town, was deemed to be a perfect site for relocation in 1925. After World War I, Germany was financially decimated, and the socialist idealists of the Bauhaus wanted to produce architecture and design that would better German society. 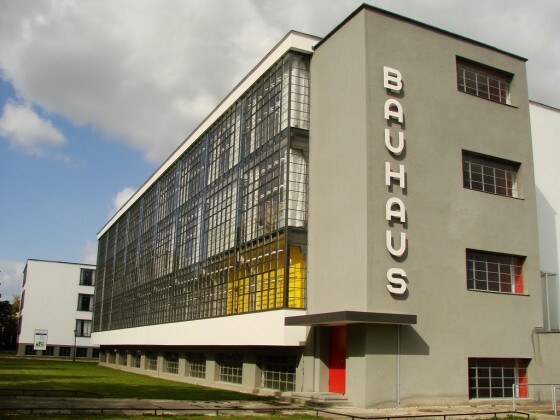 In order to make design affordable and accessible for everyone, the Bauhaus emphasized industrial techniques, believing in the power of new technologies, mechanized production methods, and materials to help achieve their goals. Wary of its liberal agenda, pressure from Hitler and the Nazis effectively shut down the Bauhaus in 1933. The architectural design of the Bauhaus stemmed from this belief system as well, representing a shift towards the machine aesthetic. In fact, the Workshop Wing looks like a factory. Gropius streamlined and designed every building in the campus for maximum efficiency (the definition of functionalism, or form follows function). Indebted to Sullivan, nothing was included that was not needed, and the exterior design echoed the internal functionality of the school. This pared-down aesthetic could also be related to the ideals of Modernism, such as the streamlined aesthetic of Piet Mondrian’s De Stijl movement, which attempted to find the universal essence of painting. Like Mondrian, Gropius’s “honest” approach attempted to express the essence of these new industrial materials without hiding them behind decoration. The building itself resembles a geometric modernist grid, with long, uninterrupted planes of continuous windows, a flat roof, right angles, and a lightness that opens up the space. Notably, its only color—a primary one at that—is its red door. The term ‘International Style’ derives from a 1932 MoMA exhibition. In the twenties and thirties, the International Style was seen as an avant-garde style used for private residences and progressive institutions. In the forties, due to the Great Depression in the US and the overall economic hardship in Europe during and after World War II, new trends in architecture stalled with only a few exceptions (see Fallingwater below). After World War II, the United States found itself to be one of the sole surviving economic, political, and cultural powers. And so, in the fifties, America’s economy rebounded, and funds were once again available for a building renaissance in its major cities. In this big wave of new buildings, architects adopted that style that had currently become popular and more mainstream. The Lever House, designed by Skidmore, Owings, & Merrill in New York City (1951–2), represents the culmination, or the maturity, of the International Style in the service of corporate culture. This skyscraper was the first large office building created in the International Style right in the heart of Midtown, and it began the trend of International-Styled office buildings in the US and abroad, to the point where the style has now become ubiquitous in any major city. Review with your students the major characteristics of the International Style that they can see in this building through description: it is a tall rectangular slab, raised on pylons that support its first enclosed level (encased with glass that you can see through to the other side of the street—therefore showing off its feats of engineering), displaying a glass curtain (like the Bauhaus) of alternating green and brown glass windows and a geometric shape without any extraneous decorations. Also, remind your students that when this building was originally built, it stood out from the architectural fabric of the city—it did not respond to or incorporate its environment (remaining “autonomous” like a modernist artwork). The original, surrounding buildings were encased in stone, so the Lever House was a radical departure. The Lever Company saw the value that innovative architecture could have for the firm, as its new building generated a lot of publicity. As Lever makes soap, which is associated with cleanliness, sharpness, and clarity, this new design made the buildings around it look old and dirty. The trend set by the Lever House’s use of International Style has been coopted by corporate America, so it can be seen today throughout Midtown and the entire city. The style stayed popular until around 1972, when it was largely supplanted by the introduction of postmodern architecture. Frank Lloyd Wright’s career ran parallel to the development of the International Style, but he conceived of his designs very differently. Stemming from ideas of the Arts and Crafts Movement (lasting between 1880 and 1910), Wright believed that technology had taken over every aspect of our lives and felt the need to counteract this through a more personal, holistic design (“total design”). Wright did not like the International Style, finding it too impersonal, lacking in detail, and too separated from nature. He strived for more elaborate and personalized detail, as well as a harmony of his buildings with their environments. He wrote, “Modernistic houses managed to look as though cut from cardboard scissors…glued together in box-like forms in a childish attempt to make buildings resemble steamships, flying machines or locomotives” (Frank Lloyd Wright, “The Cardboard House”). But, while Wright’s work was unique, it shared more affinities with Modernism than he would probably admit, such as his use of geometric box-like forms, modern and industrial materials, and mechanically reproducible technologies. Wright studied engineering at the University of Wisconsin and actually worked for Louis Sullivan starting in 1887 in Chicago, taking from him a belief in functionalism. Proving his affinity with the Arts and Crafts Movement, he helped found the Chicago Arts and Crafts Society in 1897. By the turn of the century, he started to take his own commissions on the side. One of his first, most famous structures is the Robie House (1906–9), a domestic residence built in one of Chicago’s fastest-growing suburbs. Like the International Style, Wright designed an open-plan interior with flexible spaces. He took great pains, however, to make sure his designs did not look like machines. The Robie House characterizes the peak of Wright’s “prairie style,” where the house is built all on one level. His design, therefore, spreads outwards into its environment and, through the roof’s prominent horizontal accents, echoes the flat landscape of the Midwest. To enhance its connection with nature, he included a wraparound porch and used earth tones. The interior is a work of total design, meaning that Wright designed everything from the lighting fixtures, the inset bookcases and shelves, the furniture, and the silverware. He also integrated custom-designed lighting and flower holders into the walls and into each corner of the table. He repeated the horizontal lines of the exterior in the moldings and windows of the interior. Again, while Wright felt strongly that buildings should not look like machines, he did use machines to create mass-produced and affordable objects (i.e., the chairs in the Robie House are built from machine-cut pieces). The central arrangement of the fireplace brings warmth to the heart of the home, very much in contrast with the coldness Wright saw in the International Style. The low ceilings, pitched at orthogonal angles, also give intimacy. Inspired by Japanese domestic architecture and prints (which he collected) and Art Nouveau, he focused on an honest expression of the materials and incorporated natural forms into the decoration. Everything is in harmony with everything else. Midcareer, Wright designed one of his most famous buildings (voted best building in the US in 1991 by members of the American Institute of Architects) Fallingwater, or the Kaufmann House in Bear Run, Pennsylvania (1937). Despite the Great Depression, Wright had a few commissions, which included this house, intended by the Kaufmann family as a vacation home (Edgar Kaufmann was a wealthy department store owner). This house probably best exemplifies the incorporation of nature into his work. First, the house was built directly on the side of a hill in the middle of the forest. Second, he constructed the house in order to not disturb the existing environment as much as possible: beams were curved around trees, several large boulders were built into the foundation of the house, and a natural stream flows under the house unimpeded. His cantilevered roofs and terraces radiate outward, again incorporating nature without cutting it down or covering it up. The interior, like that of the Robie House, is welcoming, centralized around a fireplace. The floors and the fireplace’s hearth are made up of materials found on the site, and every detail is designed to create an overall unified design. He maintained a horizontal structure in the levels, but varies their heights creating a highly personalized design, that still, again, incorporates geometric shapes and industrial materials such as ferro-concrete. Wright’s most famous building is the Solomon R. Guggenheim Museum, built in New York City in 1959 as one of his few commissions for an urban environment (his only one in Manhattan). Wright created several buildings that incorporate the use of the circle, the antithesis of the International Style’s box, and the Guggenheim experimental design extends this motif the furthest. The project was conceived in 1943, but due to World War II, the Depression, and the Korean War, production was postponed. Also, the proposal was so complicated that it took Wright years to get all the necessary permits and to find an engineer who could build it for him. The engineer George N. Cohen figured out the best way to create the spiral ramp, based on his experience in building parking garages, by pouring concrete into a metal cage structure. Solomon Guggenheim, the head of a very wealthy mining family, commissioned the building and chose Wright based on his popular MoMA retrospective of 1940. Introducing a new cultural institution in NYC, the owners wanted to create something that broke architectural norms and was highly visible. Wright wanted to design something to leave an unforgettable mark in Manhattan, especially in a neighborhood adjacent to other major art museums like the Neoclassical-styled Metropolitan Museum of Art. This building stood out, surrounded by prewar, limestone brick buildings on one side and Central Park on the other. The building is divided into two main, circular parts: the main exhibition hall and a small administration wing. A smooth, unbroken white band connects the two structures aesthetically, and the main hall radiates outwards as it goes upwards. Inspired by a renewed interest in ancient civilizations and their structures, Wright designed the spiral like an upside-down ziggurat. Inside, the main gallery is a continuous white spiral around a central void ninety feet across at its widest point. Throughout the interior and the exterior, there are no right angles or abrupt changes, with the circle repeating itself over and over (even in the sidewalk, the silverware, and the furniture). Like Fallingwater, the interior mirrors the exterior, and the ramp is cantilevered, jutting out into the central space as if it is floating. The spiral, in addition, brings to mind organic forms and activates the space in a dynamic way. While the main hall’s lack of windows shuts out the city, it still brings in natural light from its central glass skylight. In the administrative section, windows bring in views of Central Park. Altogether, Wright continued to incorporate nature into his designs, even in the center of one of the biggest, busiest cities in the world. The winding interior ramp connects gallery bays that serve as exhibition spaces to display artworks. The spiral design, with its awkward spaces and uneven floors, has been notoriously hard for curators to work with, but it is innovative in its conception of museum/viewer/art interaction. The spiral, in fact, determines the circulation of museum visitors either up or down the ramp, in contrast to the typical museum rectangular room design. In its open design, visitors have a 360-degree, uninterrupted view of art and can look across the space to other bays, perhaps engaging them even more so with the artwork. The Guggenheim’s design calls attention to itself, rather than posing as a “neutral” white cube, and competes with the work on display. The building is, indeed, the most valuable object in the Guggenheim’s “collection.” Most visitors visit the Guggenheim in New York to see the building itself, rather than the art on display. The spiral has become so iconic that it has been established as the brand image of the museum. This strategy, using architecture as an artistic statement to garner popularity and publicity, becomes important for postmodern architecture. which tends to emphasize individual style over standardized forms. To transition to postmodern style, show the Lever House with an unknown iconic postmodern building (i.e., Michael Graves, Portland Building, 1982) to do a formal comparison to see the shift in styles. Visually, the two buildings are very different: Graves’s uses many more colors, different kinds of materials, and mixes styles. In contrast to the rigid austerity and balance of the Lever House, the Portland Building is different on all sides and has decorative elements that do not reflect the interior functions of the building or act as structural supports. While he was theorizing this new style in his writing, he designed the Vanna Venturi House (aka Chestnut Hill House) for his mother, a building that has come to epitomize postmodern style. In it, he violated all of the major tenets of the International Style and embraced the “ugly” and the ordinary of American suburban architecture. The stuccoed façade of the house rises above the rest of the house, is not balanced or symmetrical, has a different number of windows on each side, and hides the entrance. The roof is gabled, in contrast to the flat roofs of the International Style, and elements are added that have no function other than decoration, such as the broken arch over the entrance, the gap between them, and the straight lines bisecting the windows. The form of the exterior is also separated from its interior function, without any indication of its floor plan or configuration. The interior’s design is arranged asymmetrically as well, through the use of different angles, triangles, squares, and circles. Compared to the simplified exterior, the inside is complex. The staircase, for example, is made of two converging lines into a crooked, acute angle and the ceiling is inconsistent in shape, including some occasional barrel vaults. Overall, the building expresses Venturi’s new ideas: to communicate multiple styles and meanings, and to move away from the stark, glass box of the International Style. The postmodern architectural style culminates with the designs of Frank Gehry. His early style can be seen in the Chiat/Day Building with Binoculars, created in 1991 in collaboration with the artists Claes Oldenburg and Coosje van Bruggen in Venice, California. This exemplifies the postmodern idea of architecture as artwork in a much more playful mode than the International Style. It also foregrounds an eclectic style with variations of materials and surfaces. In other words, the building is made of three very distinct styles that do not really make any sense together—almost to the point of looking like three separate buildings. Gehry designed this building as the headquarters for the Chiat/Day advertising firm, who were known for clever campaigns and wanted a building to reflect their creativity and humor. Oldenburg and van Bruggen, well known by this point for their large-scale public artworks of everyday objects, were asked by Gehry to contribute a sculpture-like building to unite the white, boat-like building, and the copper tree-like building. Their Binoculars, forty-three-feet tall, act as the entrance portal to the interior and the exaggerated, decorative focal point of the building as a whole. Gehry’s style found maturity in his expressive Guggenheim Museum designed for Bilbao, Spain and built from 1991–7, which can mark the end of Postmodernism, though it continues to influence contemporary architecture. A comparison of this building can be made with the New York Guggenheim, considering both are within the same franchise and act as statement-buildings to draw museum visitors. Gehry, like Wright, was chosen because of his reputation for unorthodox materials and inventive forms and his sensitivity to the environment. In a sense, this building represents a culmination of the postmodern style, the ultimate antithesis to the glass cube, but Gehry also wanted to move away from the historical pastiche used in so many other postmodern buildings. Here, he was more inspired by aquatic forms (i.e., fish) and nature rather than past architectural styles, motifs that he would repeat several more times in his career. New computer technology, comparable perhaps to the new technology of the nineteenth century, enabled Gehry to add multiple curves in the building’s walls while still ensuring structural and economical viability. Typical of Gehry’s style at this time and thereafter, the Guggenheim, Bilbao has a structure that consists of radically sculpted, organic contours. These walls are definitely not functional, taking the International Style’s flat glass walls and giving them dynamic movement. Here, more is more. Gehry also made sure to respond and incorporate aspects of the location, such as its use as a port town, designing the building to resemble a ship, waves, or fish scales surrounded by actual water. Like Wright’s Guggenheim, this structure is a sculpture in its own right and became a major destination for Bilbao, putting the city on the map and making it into a huge tourist attraction. The museum was opened as part of a project to revitalize Bilbao, and due to its popularity and fame, it made a difference almost immediately (the building received a lot of positive attention from both art and public audiences). Called the “Bilbao effect,” this project has inspired other architects and cities to do the same thing—moving architecture into a more spectacular style that might mirror the more spectacular, crowd-catering art of the 1990s and 2000s. Robert Venturi, Vanna Venturi House, 1961–4. In order to review the concepts covered during the lecture, do a “Who did what, and why?” slide at the end of class with three unknown buildings: one International Style, one by Frank Lloyd Wright, and one postmodern. Ask your students to break into groups and decide who did what, and why, and then compare and contrast the three buildings as a class. Taking a cue from Venturi, you can also assign your class (depending on where you might live) to note the vernacular tendencies in descriptions of nearby residential, retail, and/or school buildings. Have them compare what they have learned to what Venturi chronicles in his Learning from Las Vegas. Amy Raffel (author) is a PhD candidate at the CUNY Graduate Center. She has a Master’s degree in Contemporary Art history from the Institute of Fine Arts (NYU) and has taught Introduction to Modern Art as a Graduate Teaching Fellow at Lehman College since 2010. Currently, Amy is a genome contributor for Artsy and editor and contributor to Art History Teaching Resources.